Interesting, when I was reviewing their discography, I stopped at their inconsistent Works II. How could I forget their much maligned crapbeach? To tell you the truth, I don't really find this album an abomination at all. Sure, the first side have them playing classic rock/pop with Greg Lake sounds like a lounge singer instead of the guy who sang in Epitaph and the second side is an uninspired (for them) epic. However, do not blame the members so much (who even themselves have a strong dislike for this album). 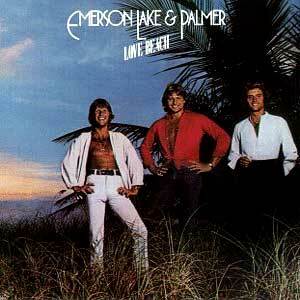 Love Beach was recorded quickly (I think I heard that it was recorded in two days) and as an obligation to a label. I also read that the guys were already tired and wanted to call it a day, and they had this burden to record an album quickly. So, you wouldn't expect these guys to record something great. On a positive note, the sound quality is crystal clear, the short songs usually are not boring and many melodies are acceptable if you are willing to forgive the horrible lyrics. C'mon, the album is not the worst prog album of all times. I do not think it is even a bad album. Just a band being forced to do something quickly when they just wanted to rest.